As I’ve scrolled Pinterest, I’ve noticed Scripture writing seems to be a popular way to allow God’s word to marinate in our hearts. There’s good reason for this: it forces us to slow down, think about what we are reading, and it combines motor with mind/memory which can be very powerful for learning and retention. All this increases our understanding of God’s word and allows Him the space to speak into our lives… and this is just a portion of the benefits of writing scripture! P.S. 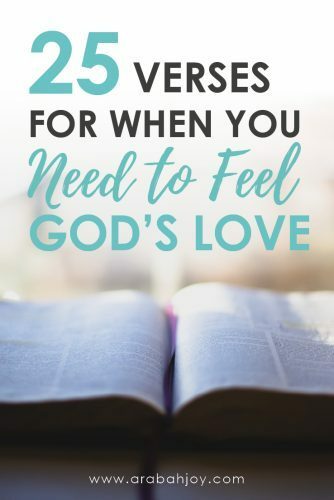 Below we’ve included a Scripture Writing Plan for when you need to feel God’s love! Scroll down to grab your printable! 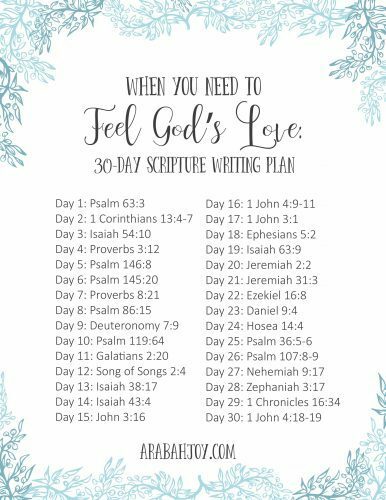 Last year on the blog, I provided monthly scripture writing plans as a way to help this community get into God’s word and it’s safe to say we all fell in love with daily scripture writing! 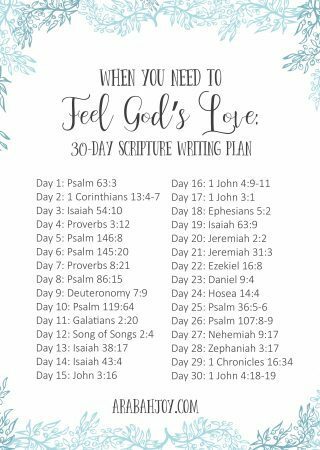 Today, I’d like to share some basics on scripture writing as well as a 30-day scripture writing plan for when you need to feel God’s love. 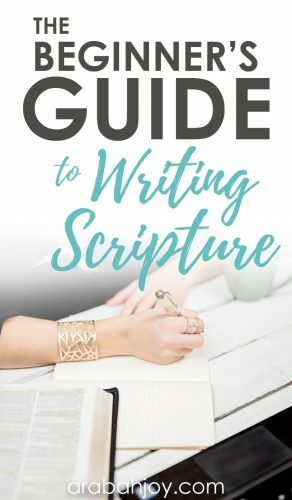 Your scripture writing need not be anything complicated, and it can be as simple as purchasing a journal and making the commitment to write a portion of scripture each and every day. Having a scripture writing journal dedicated just for this is so helpful! 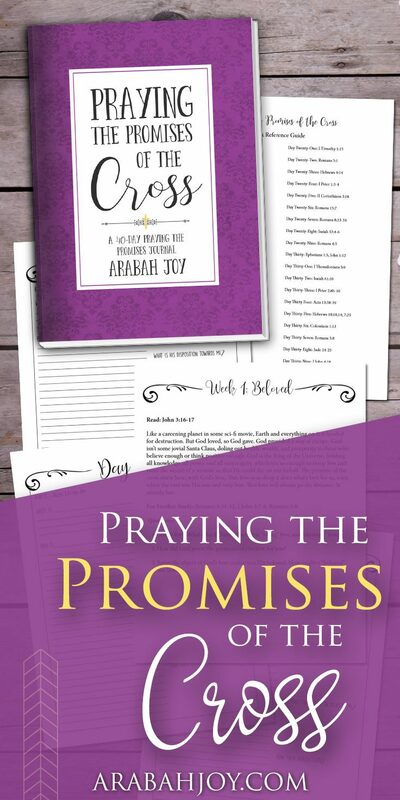 Alternatively, all our Praying the Promises of God prayer journals are designed to give you a daily scripture writing plan with plenty of space to write and journal your prayers. Check them out in our store here. For people who are more creative, you can experiment with color coding using different colored pens to make your writing more artistic, and some creatives like to employ the use of glitter pens and other fun writing implements. What do I think this scripture means? How does this verse apply to my life? How does this scripture enhance my view of God? 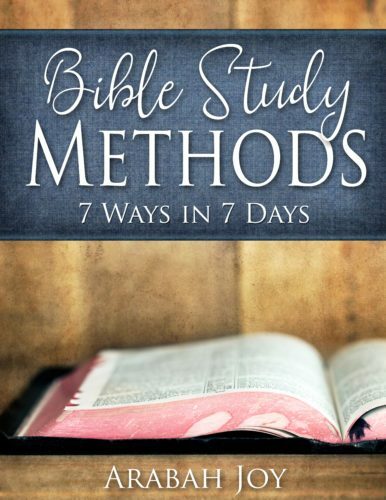 Your scripture writing routine does not need to be elaborate and can be as quick and easy as you would like it to be. It can take just a few moments of your day to sit and write out a verse, or you can try Bible journaling and draw ornate decorations around your verse if you have more time and the desire to do so. You can choose to write verses around a theme as you search for verses related to a specific word or concept. Or you can write through a book of the bible. There are many ways to get started! Proverbs 30:5 says, ‘Every word of God is pure: he is a shield unto them that put their trust in him’. Timothy 3:16-17 says, ‘All scriptures is given by inspiration of God, and is profitable for doctrine, for reproof, for correction, for instruction in righteousness that the man of God may be perfect, thoroughly furnished unto all good works’. Psalm 12:6 says, ‘And the words of the LORD are flawless, like silver purified in a crucible, like gold refined seven times’. If God’s word is that powerful, any way we can increase our interaction with it is a good thing! The scripture says in Psalm 119:15: ‘Your word is a lamp for my feet, a light on my path’. When you practice writing the scriptures, you will gain insight into spiritual principles, as you walk along the pathway God would have for you. It can be difficult to discern what course of action you should take when you are not in the word of God, and scripture writing can help solidify God’s principles in your mind when making the various decisions that come your way. Psalm 119:130 says: ‘The unfolding of your words gives light; it gives understanding to the simple’. If we were honest, we would admit that we often don’t understand what is in front of us much of the time, but we needn’t worry, as we can glean wisdom and insight by reading God’s word. Philippians 2:16a says: ‘Then you will shine among them like stars in the sky as you hold firmly to the word of life’. Many of us come into this world with baggage in the form of lies we believe, and it can wreak havoc in our day-to-day existences. Lies have a way of ensnaring us, as they weave tightly around our lives, choking out any sense of security or stability we might otherwise have. John 3:17 says, ‘For God did not send his Son into the world to condemn the world, but to save the world through him’. The truth is that, as His daughters, many of us feel condemned by God for one reason or another. God’s word contains the truth that we can internalize and use to break old habits and sinful patterns. John 8:32 says, ‘Then you will know the truth, and the truth will set you free’. Matthew 11:28 says, ‘Come to me, all you who are weary and burdened, and I will give you rest’. We can find rest for our souls by understanding the word of God, and scripture writing is a unique tool to help us do that. Romans 15:4 says, ‘For everything that was written in the past was written to teach us, so that through the endurance taught in the Scriptures and the encouragement they provide we might have hope’. If you read Hebrews chapter 11, you will find what many refer to as the Bible’s hall of fame. We read of the great faith of Abel, Enoch, Noah, Abraham, Isaac, Jacob, Joseph, Moses, the Israelites who crossed through the Red Sea on dry land, Rahab, Sarah, and others. The passage speaks of the mighty things people were able to do by believing in God’s promises, and it helps to spur us on to attain great faithfulness, too. After this roster of impressively faithful men and women, Hebrews chapter 12 and verse 1 says this: ‘Therefore, since we are surrounded by such a great cloud of witnesses, let us throw off everything that hinders and the sin that so easily entangles. And let us run with perseverance the race marked out for us’. Romans 10:17 says: ‘Consequently, faith comes from hearing the message, and the message is heard through the word about Christ’. It really is simple. The more we hear the word of God, the more we are spurred on to developing great faith of our own, and scripture writing can help us in this endeavor. 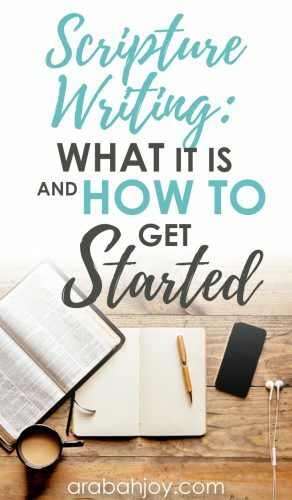 Are you ready to try scripture writing for yourself? 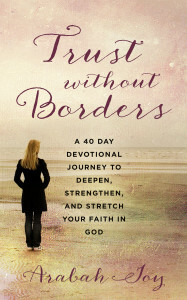 Why not grab this scripture writing journal and use the 30-day scripture writing plan below? 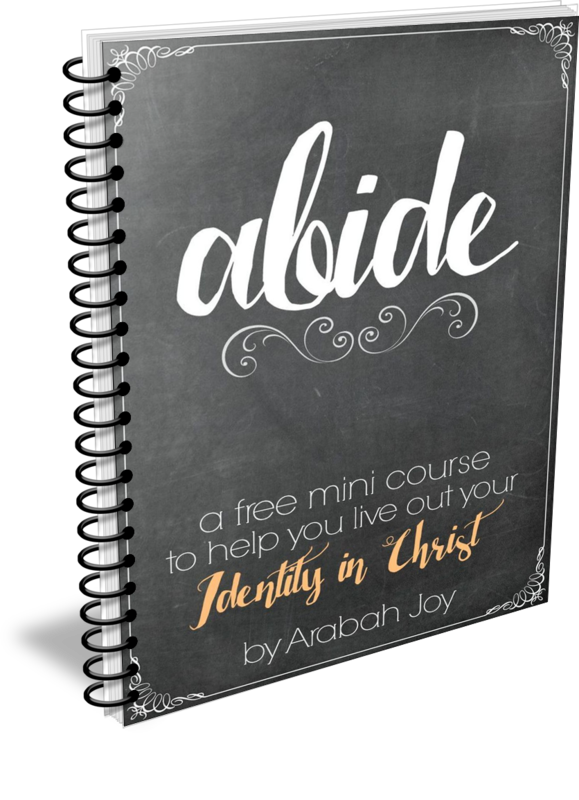 It centers around the theme of God’s love for us and is a great place to get started… but you can create monthly plans for yourself that will enable you to dig down deep into any topic you choose! This is so rich! Thank you for sharing your insights. I am going to start scripture writing today! God bless you for your ministry!